The woman who struck and killed two pedestrians in Fort Lauderdale last month was arrested on DUI manslaughter charges Wednesday after a toxicology report showed she her blood alcohol level was more than twice the legal limit at the time of the crash, police said. Alyza Rachel Russell, 22, surrendered without incident at the Broward County Main Jail Wednesday morning after traffic homicide investigators obtained a warrant for her arrest, the Broward Sheriff's Office said. She posted her original bond, but during a court appearance, Broward Circuit Judge John Hurley raised it to $450,000, almost seven times the initial amount. The higher total was announced after prosecutor Eric Linder said the state had strong concerns that Russell, who has dual citizenship from the U.S. and U.K., posed a flight risk. Russell is charged with two counts of DUI manslaughter, two counts of unlawful blood alcohol level, one count of DUI property damage and one count of unlawful blood alcohol level property damage in the fatal June 13 crash that killed 30-year-old Mackendy Jules and 35-year-old Samuel Martindale, Fort Lauderdale Police said. The crash happened around 2:15 a.m. in the 500 block of W. Broward Boulevard, when Russell tried to make a left turn in her 2012 Porsche Panamera but lost control and drove through the hedge of a nearby parking lot. Jules, Martindale and a third person were standing in the parking lot at the time. The third person was able to escape the path of the car, police said. Russell had been taken into custody but was released pending the results of a blood test, police said. According to police, the toxicology report showed Russell's blood alcohol level to be .17, more than twice the .08 limit in Florida. 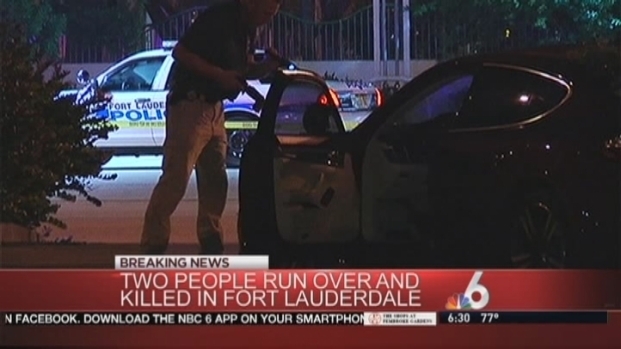 Two people were killed after they were struck by a car in Fort Lauderdale early Thursday. Fort Lauderdale Police say 22-year-old Alyza Rachel Russell is in custody. Soon after the wreck, prosecutors said, detectives got a surprising tip from Russell's coworkers. “The party stated that, during the day, Russell had made statements at work that she was planning to flee the country to Ireland,” Hurley said. She paid for a new British passport after the crash, according to authorities. Citing her family's financial means, and the prosecution's case, the judge didn't budge on the raised bond. Hurley ordered Russell to surrender all of her passports, and said if she is released before her trial she will have a GPS monitor. Police are investigating after two people were struck and killed by a car in Fort Lauderdale early Thursday. Witnesses Byron Campbell and Michael Lacey and Fort Lauderdale Police spokeswoman Det. DeAnna Greenlaw comment.